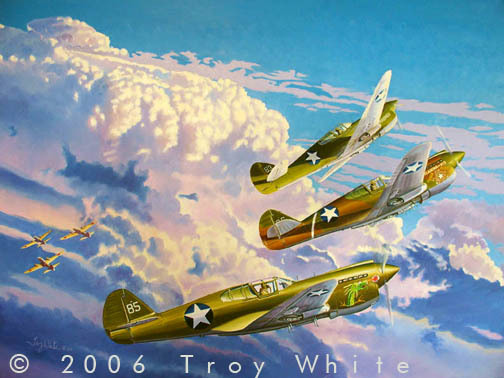 Troy White © 2006, Oil on Canvas, 36" x 48" SOLD. Churchill was referring to the RAF pilots who defeated the Germans in the Battle of Britain in 1940 but the same could equally be said of the men of the 49th Fighter Group. When the Japanese attacked Australia in early 1942 they wiped out most of the Australian and American aircraft in the Northern Territory. The seasoned Japanese pilots flew with impunity over the Northern Territory until the inexperienced pilots of the American 49th Fighter Group went into action against them in March. Despite overwhelming odds the 49th made raids on Australia too costly for the Japanese. By the time the 49th FG moved to New Guinea eight months later they had destroyed 70 Japanese aircraft. The 49th FG was in combat constantly up until the end of the war and was the highest scoring allied unit in the Pacific with 664 aerial victories. In the painting above are (top to bottom) Lt. l.B. 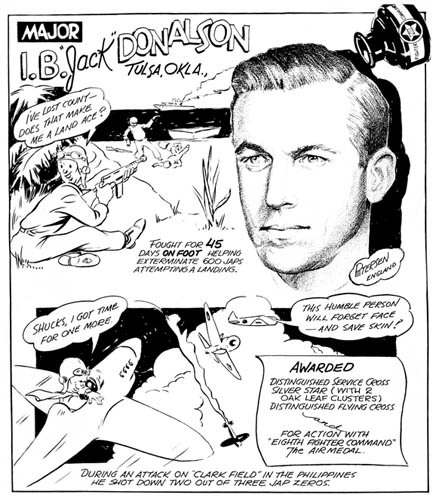 “Jack” Donalson leading Lt. Andrew Reynolds and Lt. George Preddy into an attack on Mitsubishi bombers. They are all flying their assigned P-40s as they would have looked at the end of the second week of June 1942. All three pilots became aces. Reynolds had 9.33 and Donalson had 5 victories against the Japanese and Preddy had 26.83 against the Germans. The original oil painting is on display at The Australian Aviation Heritage Centre, Darwin, NT Australia.